Gold Ring from Medieval London, approximately 1400s. 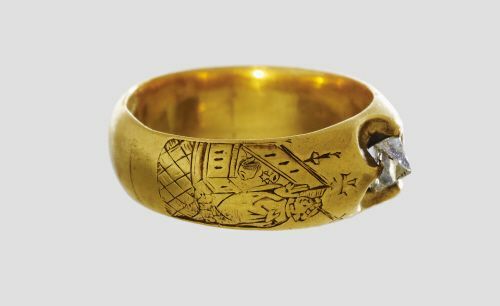 Decorated with engraved figures of St Thomas Becket and other Christian figures which were meant to protect the ring’s owner from harm. 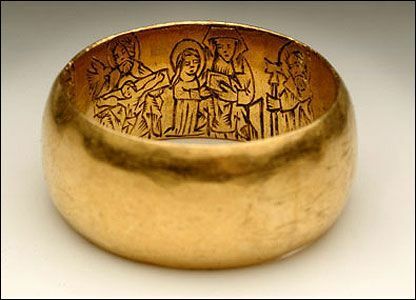 Finger ring, made of gold and diamond, 1400s in England The ring is engraved; one shoulder depicts Virgin and Child, other depicts St Thomas à Becket before altar with sword piercing head; trefoil bezel containing diamond.